what a fantastic blog!!! so informative, I love it. I have just got my first T, G. porteri. I have been told it is female and around 3 years old but for reasons I am not overly confident in that information. I am going to get G. porteri an enclosure from House of Spiders (I’m in the UK) as I want to admire her from all angles! Would you say that 12x8x8 (inches) is the correct size? 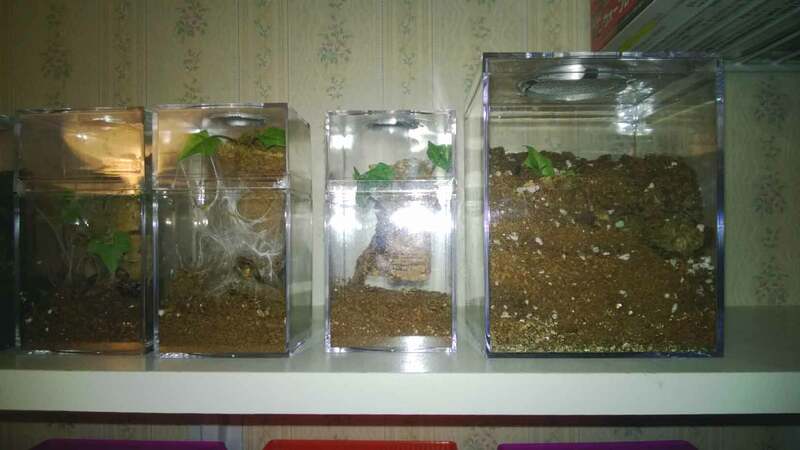 Also they do a Tarantula Starter Kit, which is that size tank plus a few accessories including substrate, would I be better just getting my own sub? what do you suggest for G. porteri? Do I need to bury the water dish and can I use tap water? Also what kind of hide shall I get and are crickets adequate? Sorry about all these questions Tom but I really want to get it right. I would really appreciate any advice or tips. Congrats on your new pet! A G. porteri was also my first tarantula; she was a young adult when I acquired her, and 18 years later, she’s still going strong. A quick question: what size is your T? Can you estimate from the tip of the front leg to the tip of the opposite back leg (diagonal leg span or DSL)? If she’s a young adult, a cage 12 x 8 x 8 inches (as long as it’s 12″ in length and NOT height) will be fine. Just make sure that you put in enough substrate to ensure that if she climbs (and she will!) that a fall wont hurt her. As long as they give you enough substrate to fill the enclosure enough to prevent the T from getting injured if it should fall, then it’s a good deal. For my G. porteri, I use dry coco fiber. However, dry peat or topsoil would also work fine. I use cork bark for a hide, although mine rarely uses it. She’s usually sitting right out in the open. There is no need to bury the water bowl. It will be fine sitting on top of the sub. When you place it, however, try to keep it away from the edges. If the T climbs, it can fall on the edge of the dish and injure itself. I have well water, so I have no problem using water from the tap. If you have city water, or water with fluorine added, you may want to used bottled. 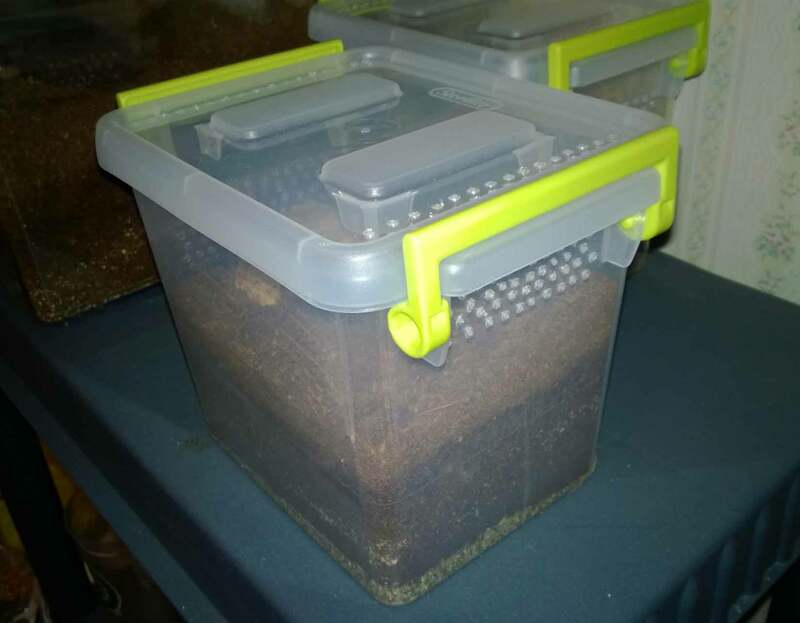 I just checked the listing for their Tarantula Starter Kit, and there are a couple things included that I would set aside. First, do NOT use the heat mat. Unless your home gets very cold during the winter, supplementary heat with this species will be unnecessary. Heat mats can be dangerous as the spiders will sit on them and dehydrate. Also, the hygrometer is pretty useless. 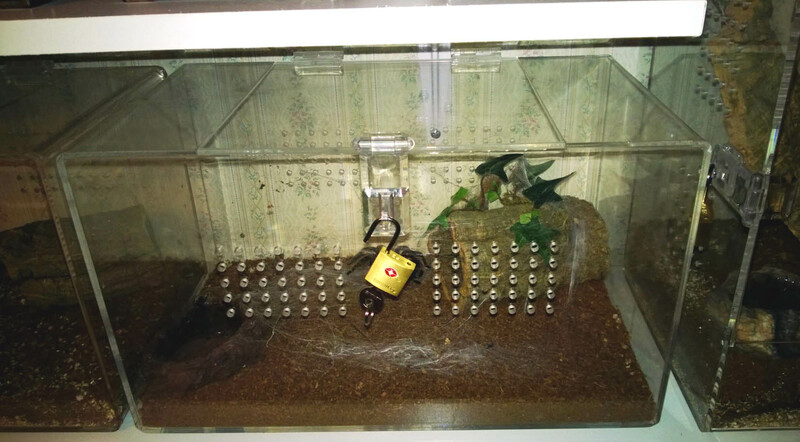 Analog hygrometers are notoriously inaccurate, and the G. porteri likes it dry, so there is no need to monitor humidity. I hope that helps. Please let me know if you have any other questions! thank you for such a speedy reply. Yes I’m really over the moon with G. porteri, she looks so adorable if you know what I mean!!! I’ve just had a look and I estimate the space between her back and front leg (tips) to be between 2-2 and a half inches, she’s really not that big. I’ve decided not to get the starter kit, just the enclosure and accessorise it myself. So you think those dimensions will be suitable for her? there are other sizes listed but I’m awful with measurements, sizing etc. Ok I’ll order some Eco Earth, if I get the loose bag (not the brick) can I just put it straight in without adding water? 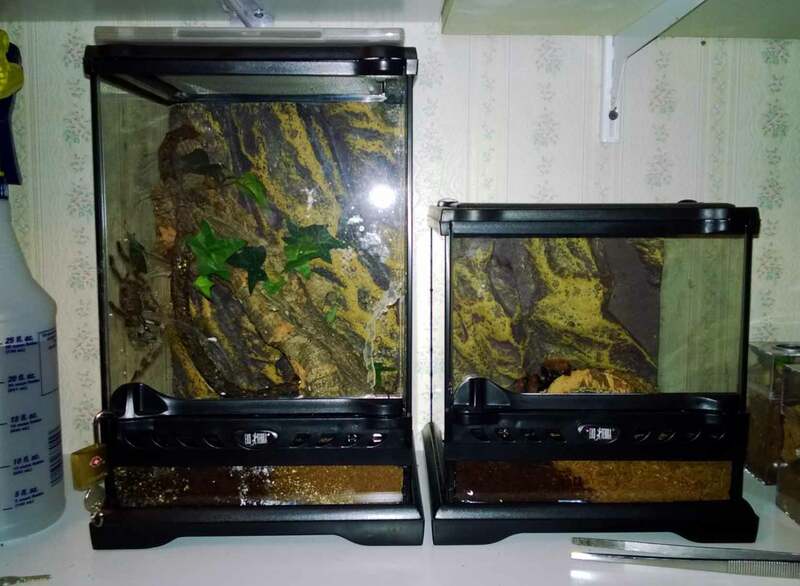 Do you just add a hide and water dish to each enclosure? I guess the fake plants are just for decoration? Yup, I’m a big fan of this species. They are truly cute at that size. If she is about 2″, the cage you are looking at might be a little large for her. Don’t get me wrong, you could certainly house her in it. It will just take a while for her to grow into it (they are very slow growers). Again, you can still use the larger enclosure, and it wouldn’t be wrong to do so. The smaller one is just a bit better sized for a smaller T.
If you buy a bag of Eco Earth (and not the brick) you won’t have to add water. In fact, you may have to dry it out a bit. G. porteri like it dry, so if the substrate is too moist, they will usually climb the walls until it dries up. To dry it, you can either leave it out a few days, allowing the extra moisture to evaporate, or bake it in an oven on about 175-200 degrees heat for 15 minutes to a half hour or so. If you bake it, just put it on a cookie sheet or large, shallow pan, keep the oven door open, and stir it occasionally. I usually add a hide and some plastic plant if I have them. The plants for a G. porteri would be only for decoration. With some of my other species, they will use these to anchor webbing to. I want to know what light I can use for my Chaco Golden Leg Tarantula. I want to begin a terrarium with real plants but in order to do so I need a light to keep the plants alive! The light must not hurt my beloved Tarantula! Please help me! First off, thank for the kind words! What size is your T? How long have you had it? Personally, I wouldn’t attempt a natural enclosure with a G. pulchripes (Chaco golden knee) for a variety of reasons. Although they tolerate light, they don’t like bright light. Those that create naturalistic enclosures with real plants choose ones that don’t need a lot of light. If you want your Ts to be happy, you want to keep them away from bright light sources. Many keepers will even use red lights in their tarantula rooms for nighttime viewings. Also, plants require water and this is a species that likes it on the dry side. Those who create enclosures with real plants do so with species that have higher humidity requirements (like Avicularia species and the big tropical terrestrials. These guys would actually benefit from the moist substrate and higher humidity. By keeping the soil moist enough to allow for plants, you’ll inadvertantly create a high humidity environment for your G. pulchripes, which wouldn’t be ideal. Finally, most G. pulchripes are little bulldozers, constantly digging and rearranging substrate. They would likely spend their time digging up the plants (although, perhaps yours isn’t a digger). I’ve seen some examples of naturalistic enclosures, but they are difficult and only appropriate for certain species. It’s probably not what you want to hear, but I wouldn’t try it with that species. I love those jars! The gallon sizes are great for juvenile arboreals. I’m looking for an enclosure for an adult Theraphosa blondi. At least 20″L×12″W×12″H. Can u help. An also one for an adult Mexican red knee. Maybe not as big though. Hi, James. What is your price range? Are you looking for something high end, like an acrylic enclosure, or something functional and less expensive? Functional works for me. I’d make an acrylic one myself if I know what type of glue to use. And get 2″ vents. Love your videos and why you do for the hobbie. Do you have a role of thumb on how many holes to pit into what size of sterilite container? Also, what do you wash them with to get rid of the plastic smell. You can wash them with Dawn dish soap as long as you rinse them really well. Once you get the dirt in, the plastic smell dissipates rather quickly. As for the holes, I’ve done a LOT of experimenting with how many to put in. I usually put three rows of 10-20 (depending on the size of the container) on both of the short sides, then another 10-20 on the long sides. 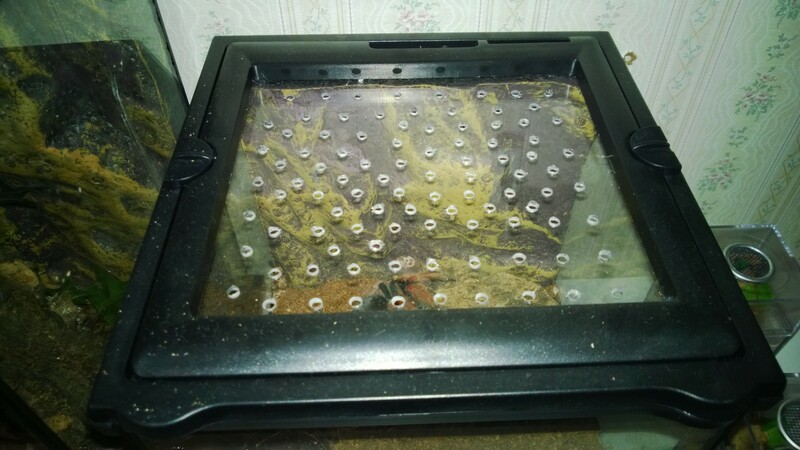 When housing moisture dependent species, you’ll want to play around with them to make sure you have enough ventilation to keep the enclosure from getting stuffy, but not so much that it dries out super fast. First, I want to say I love your site! It’s been super helpful for me as I’m starting out and learning all I can. I got my first T back in September. I currently have an adult female Grammostola rosea and a 2″ Grammostola pulchripes. I’ve been using Jamie’s adult enclosure for my rose hair and my little guy enjoys shoveling substrate around his Exo Terra breeding box. 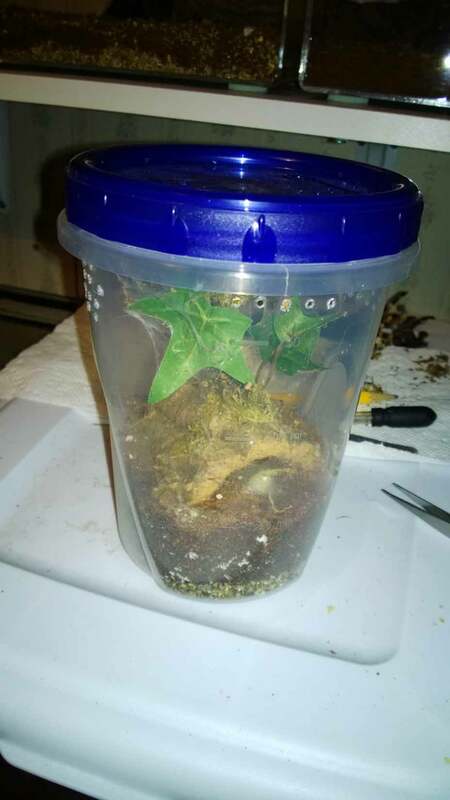 I’m about to adopt an adult B. smithi/hamorii, and I’m trying to see how quickly and cheaply I can put together a good enclosure for her. Do you recommend glass aquariums? Is there enough ventilation if it has a screen top? I’m asking because I have a 10 gallon one lying around from when I had fish, so that would be easiest for me to clean up and put together on short notice. 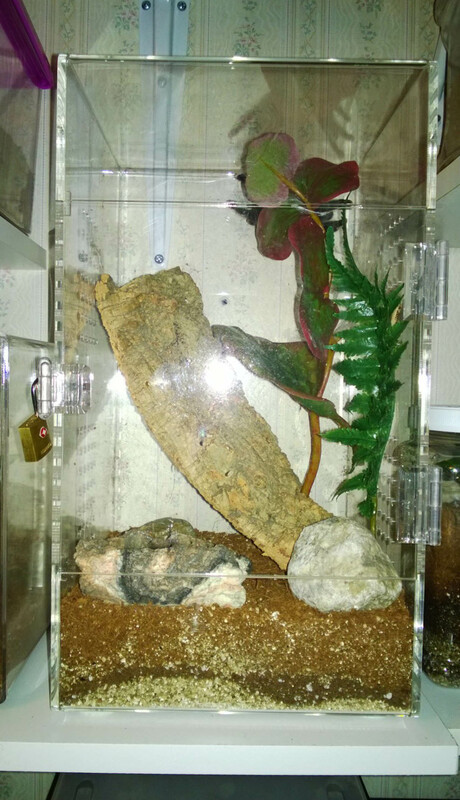 When I have the extra cash, I’d love to get another one of Jamie’s enclosures! Hello! Thanks so much for the kind words; I’m so glad that you’re finding this helpful. What size is the B. hamorii? A 10-gallon aquarium can work for larger specimens if set up properly. There are a a couple issues that make them a bit less suitable for tarantulas, however. 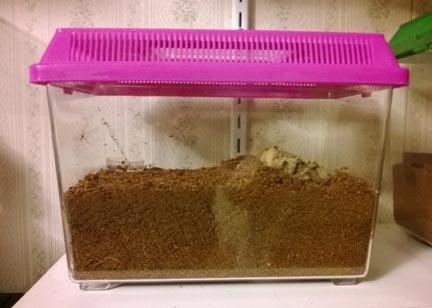 First, you’ll have to fill it with enough substrate to prevent the tarantula from injuring itself if it climbs and falls. For a 10-gallon, you’ll want 7″ or so. Also, the if the screen top is wire screen, their feet can get stuck and leave them dangling. You’ll want to get one with with thicker wire with larger gaps in between (like the ones used for larger reptiles). I hope that helps! I love your guide it has been paramount to me in my new found obsession. I recently acquired a Brachypelma albopilosum from a keeper here locally. He claimed her to be about 2 years old and she is a good size maybe 3-4 inches. She came in an enclosure that seemed way to small for her size, after talking with a friend that also keeps these wonderful creatures he recommended that I move her to a lager space. The space she came from had bone dry coco fiber and seemed like it hadn’t been changed in a very long time. 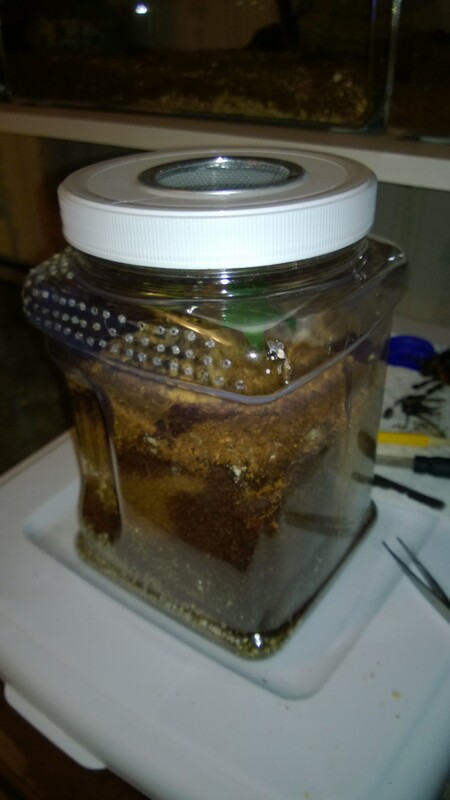 In her new enclosure I provided her with 3 inches of moist, not wet coco fiber as this is what was recommended what I had read, there is a lot of conflicting information on humidity levels as you know. My understating was that she might appreciate a slightly moist substrate, maybe I was wrong? In her last enclosure she was always hanging out in the open and very active. Since I have moved her with the help of your videos by the way. I have not once seen her on the new substrate, I have only seem her either sitting on top of her hide which came from the last enclosure or on the side glass, I even found her hanging from the top of the enclosure which I have never seen a terrestrial species do. Maybe I am paranoid but this seems like odd behavior to me, should I think about removing her and letting the substrate dry out more? Sorry for the delay, Jacob. The site hasn’t been sending me notifications for comments. This is one of those species where some specimens seem to appreciate some moisture and other do fine dry. I have four, and only one seems to appreciate some moist substrate. What you can do is moisten down part of the substrate and see if it frequents that spot. If it does, continue to keep part of it moist. Did you pack down the coco fiber? If not, they don’t like the feel of it and may climb the sides. Something to think about. Also, it could just be adjusting to its new home. I would let part dry out and see where it goes. Hope that helps!